You may be wondering what does this have to do with beauty but previously I've covered health and our health can effect our looks good or bad and the effects of smoking we all know aren't positive and maybe one of the top listings of negatives is the addiction. I use to be an occasional smoker then a daily smoker then gave it up to only pick up the habit when stressful time hits. Having something in the hand, inhaling and exhaling feeling as if the stress is vanishing with each exhale. Mama Laa, dad and my auntie all smoke for as long as I can remember. I find it easier to 'give up' even if it's a temporary term I can live without until those cravings hit. I was kindly sent the VAPESTICK MAX Electric Cigarette . It is their most expensive model at £54.99. 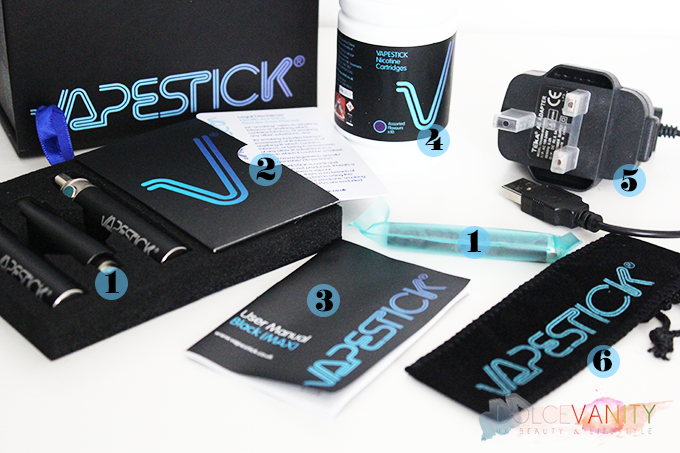 VAPESTICK have a collection of disposables & rechargeable models. An electronic cigarette. This model is larger than a normal cigarette and it's also held differently, the 'technique' to smoking this to a regular cigarette is something you adjust to. It's heavier to hold and with this model you need to press the button in the centre to release the water based vapour as you draw your breath in. There's no short puffs with this but long smooth pulls ( it's got me doing French waterfalls ). It doesn't contain any tar, carbon monoxide or any of the other chemicals that are found within a cigarette. 2x Rechargeable Batteries 2x Atomisers - The batteries will last around 7 hours all dependent on use, they are lithium-ion rechargeable batteries and will need to be replaced after a peroid of time (8-10 weeks roughly depending on usage) All VAPESTICK design starter kits come with two 150 mAH batteries. The atomisers should last between 4-6 weeks before needing a replacement. The MAX atomisers are built over a ceramic arch which maintains its efficiency and ensures a longer life span. Charger - MAX starter kits include a USB charger - allowing you to charger via your laptop or PC ) and also a wall charger. Making it easy while at work etc. When I started to smoke this my mum said it looked like I was smoking a mascara tube lol, it's a conversation piece and for some reason I never thought about electronic cigarettes that much! Now I bet your asking me so what's the benefits, how is it any different than smoking & so forth. I've had people laugh at me when I've said the benefits are because it's 'healthier' and I've heard the same response, how can any type of smoking be healthier? - I say healthier cos there is NO added harmful chemicals that is found in Tobacco cigarettes, the one thing it does contain is the nicotine which is addictive additive. You'll save money and not to mention you can smoke this ANYWHERE as these are outside of the UK Laws smoking ban. If your in a club, no more going outside when it's cold. In the cinema and get the craving, you can smoke. There's no smell, no ash. It's liquid-nicotine (where selected), flavouring, and propylene glycol (PG). 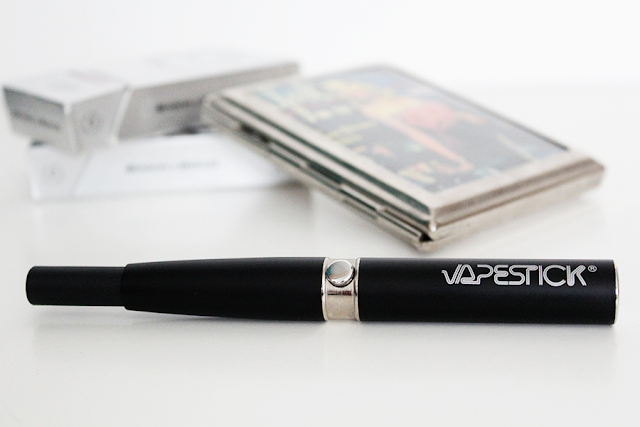 When you put this in your mouth in the MAX version you just press the button as you draw in to activate the battery which in turn releases the atomiser which vaporises the base liquid in the cartridge with your chosen nicotine. When you exhale, your only releasing a water vapour that gives the appearance of smoke. Maybe this MAX model is more for the 'males' it is targeted towards the heavier or/and more serious vapers. It did take me a few days to get use to something heavier, how to hold due to the button and to remind myself to press the button now it's become second nature. I have to admit I am an ex smoker and now an avid smoker of an electric ciggy. Whilst mine is from a different brand, I think its also great and no where near as harmful as a normal (real) cigarette. I have smoked normal ones for over 13 years (yes, I know that is bad!) and now I have been smoking my electric one for 8 months. I love that I can smoke it anywhere, inside bars and clubs, on airplanes, you name it and I have smoked it! Its such a good idea - and whilst I dont advocate smoking, I think if you are currently a smoker its good to give this a try. I have never looked back and I will never ever smoke a real cigarette again, that is for sure! Great review and thanks for sharing your experience! Oh wow, yes a lengthy smoker. My smoking family members are too! I'm going to get my mum one to see if it does have the same effect for her - think it's a good move and it's handy for a smoker who can just go wherever and smoke it since these laws have come into play. Plus I just got one with some new flavours lol it's bad to look at it as something fun but if you are a smoker it's a good thing for us - thanks for the comment love. Whoo my girl, really wow there is hope. That's so great, love that you've completely quit - good on you! That was something new to hear. Now about the E Liquid Nicotine Juice , the Scent from cigarette smoke gets into, and clings, to just about anything it comes in contact with – hair, clothes, your car – anything. Not only does the odor cling, many consider cigarette smell offensive and avoid close contact. If you’re a smoker, you don’t notice it so much since you’re immersed in it all of the time. To non-smokers, and especially ex-smokers, this smell is very noticeable.